A family member owned the gun that discharged earlier Tuesday afternoon in an East Lampeter Township home, killing a 2-month-old child, police said. Police arrived at an apartment in the 2100 block of Old Philadelphia Pike at 2:24 p.m. where they found the infant suffering from a single gunshot wound, according to an East Lampeter Township police news release. Police and other first responders tried to render aid to the young victim, but the child was pronounced dead shortly after arriving at the Lancaster General Hospital, police said. Saying it would compound a tragedy and serve no purpose, a Lancaster County judge spared an East Lampeter man prison time for accidentally shooting his infant daughter. Instead, Judge Dennis Reinaker sentenced G. Scott Davis, 36, to six years of probation Friday after Davis pleaded guilty to involuntary manslaughter and related charges in the Dec. 24 death of 2-month-old Kestyn Davis. Davis had been playing with a 9-mm handgun he’d bought earlier in December when he pulled the trigger while the gun was in his lap, according to authorities. He knew the gun had a magazine, but didn’t realize a bullet was in the chamber. The bullet struck Kestyn, who was in a swing at the other end of the room a few feet away. Kestyn died shortly after being shot in the abdomen. Almost immediately, Davis’ wife, Alyssa, and her father returned home from shopping and her father called 911. They had been picking up tuxedos so Alyssa and Scott could have a formal wedding ceremony, according to Scott’s lawyer, Jeffrey Conrad, said. The couple married in April. This entry was posted in Accidental Shooting, Baby, Dead, Pennsylvania on December 24, 2013 by usgunviolence. SAHUARITA, Ariz. — Police say an Arizona toddler is dead after accidentally shooting himself with his parent’s gun. Officer Philip Steele tells KVOA television station that the shooting happened Friday night at the family’s home in Sahuarita, south of Tucson. Steele says officers found the 3-year-old boy with a self-inflicted gunshot wound to the face after responding to an emergency call along Calle Minerva around 7:45 p.m. The boy was pronounced dead at the scene. Steele says the parents told investigators the firearm was inadvertently misplaced for a short time. That’s when the child found it. SAHUARITA, AZ, 12/20/13: A 3-year-old boy has died after accidentally shooting himself with his parent’s gun. Officer Philip Steele with Sahuarita Police tells KGUN9 that officers responded to a call in the 300 block of Calle Minerva, around 7:45 p.m on Friday. When officers arrived on scene, the boy was found with a self-inflicted gunshot would to the face. The boy was pronounced dead at the scene, said Steele. The parents told officers the firearm was misplaced for a short time, during which the child found and fatally discharged the weapon. This entry was posted in Accidental Shooting, Arizona, Baby, Dead on December 20, 2013 by usgunviolence. INDIANAPOLIS, Ind. – A 3-year-old boy has died after he apparently shot himself in the head. Detectives believe the boy shot himself after pulling the gun off a kitchen counter. It happened Saturday evening around 6 p.m. at a home on East 68th Street near Kingsley Drive. The parents of a 3-year-old boy who fatally shot himself in December were arrested Friday on charges of neglect of a dependent. The father faces an additional felony charge of neglect of a dependent causing death. Warrants were issued Thursday for Nicholas Gulling, 27, and Sandra Tomich, 35 according to a release from the Indianapolis Metropolitan Police Department. Both Gulling and Tomich were being held Friday in the Marion County Jail, Gulling on $20,000 bond and Tomich on $1,000 bond. Initially after the Dec. 7 incident in the 1800 block of 68th Street, where the boy pulled a loaded gun from a kitchen counter and shot himself in the head, investigators were preliminarily classifying it as an accident. Gulling and Tomich, and a 4-year-old sister of the boy were home at the time of the shooting. After the shooting, the child was taken to Riley Hospital for Children at IU Health in critical condition. He died hours later. This entry was posted in Accidental Shooting, Baby, Dead, Indiana on December 7, 2013 by usgunviolence. The names of the victims killed in Tuesday’s shooting in rural Crawford County were revealed Wednesday, but a motive remains unclear. Investigators believe 51-year-old Tim Adams shot and killed his 4-month-old grandson, Chayston Williams, his 4-year-old granddaughter, Kierra Adams, and 31-year-old Michael Williams, the father of Chayston and boyfriend to Tim Adams’ daughter, Ashley Adams, said Chief Deputy Jimmy Damante with the Crawford County Sheriff’s Office. The shooting happened north of the Alma city limits at 2127 Old Rudy Road, the home of Tim and Regina Adams, just before 3 p.m. Tuesday. Damante said Ashley Adams and Michael Williams had arrived at the home with the 4-month-old to pick up Kierra and another of Ashley’s daughters, a 3-year-old. Investigators believe Ashley Adams went inside the home where her two daughters and Regina and Tim Adams were. Ashley Adams and Tim Adams got into an argument over Ashley Adams’ scheduled court appearance for Tuesday and what she would do with her children, Damante said. Tim Adams went outside and retrieved a shotgun from of his pickup and shot Michael Williams, who had been waiting in the passenger side of the car with Chayston Williams in the back seat. Ashley Adams ran outside and got into a scuffle with her father, who broke free, went to the driver’s side of the car and shot the baby, Damante said. 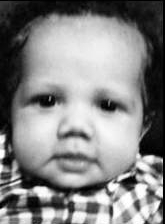 Ashley Adams grabbed the infant and returned to the home, where Tim Adams pursued her. Regina Adams ran through the house with the 3- and 4-year-old girls to get away from Tim Adams. A shot was fired inside the home, but no one was injured, Damante said. Regina and Ashley Adams ran out the back door with the two children. Tim Adams came outside. Regina Adams hid behind a pickup with the two girls, but Kierra stepped out and was shot in the back. Regina Adams then ran into the house with the 3-year-old, and Ashley Adams ran through the front door and placed the baby on a bed, Damante said. A Crawford County deputy arrived at the scene to find Tim Adams outside talking on a cellphone behind the house. The deputy recognized Adams and pleaded with him to stop and put down the gun. Tim Adams then shot himself, Damante said. Investigators are unsure with whom Tim Adams was talking on the cellphone. The bodies will be sent to the Arkansas State Crime Laboratory in Little Rock for examination, Damante said. This entry was posted in Arkansas, Baby, Dead, Domestic Violence, Mass Shooting, Multiple Shooting, Murder-Suicide on December 3, 2013 by usgunviolence. Hartsville police have charged Timothy Sanders, 40, with Murder and Possession of a Weapon During the Commission of a Crime in the shooting death of 21-month-old Madison Dolford, according to Hartsville City Manager Natalie Zeigler. Zeigler says the child’s mother, April Dixon, is charged with Accessory After the Fact of Murder and Misprison of a Felony. Sanders says he is the child’s father, but Hartsville Police Chief James Hudson says it will up to state police to determine through DNA testing if that is the case. The pair also face drug charges. A bond hearing is scheduled for them Tuesday afternoon at 4:30 at the Darlington County Detention Center. The toddler was shot in the back yard of a home on Bell Avenue about 6:15 p.m. Monday. Authorities say the shooting followed an argument between adults. Investigators say whether the child was the intended target or whether she was hit by a stray bullet is not clear at this time. Starting around October 2nd, April Dixon, 23, and Timothy Sanders, 40, conspired to murder their 21-month-old daughter, Madison Dolford, according to arrests warrants from the State Law Enforcement Division. HARTSVILLE, SC (WMBF) – The state is seeking the death penalty for the mother of a 21-month-old girl who was shot and killed in Hartsville in December 2013, officials confirmed Wednesday. This entry was posted in Baby, Dead, Domestic Violence, South Carolina on December 2, 2013 by usgunviolence. Polk County Sheriff’s Office detectives are investigating the shooting death of a 2-year-old Lakeland child. According to detectives, shortly before 8:30 p.m. Monday, the boy, Taj H. Ayesh, was taken to Lakeland Regional Medical Center by parents Hathum R. Ayesh, 36, and Stephanie Sharell Nealy, 29. The mother said Tai followed her outside to Ayesh’s truck to retrieve a pre-paid card from the vehicle. Nealy told detectives she moved aside a loaded handgun that was in the truck as she searched for the card. She said at one point as she was facing away from the truck, she heard a gunshot and saw the boy fall to the ground. Tai was rushed into surgery, but he did not survive, detectives said. A Lakeland mother will serve seven years of probation for unsafely storing a firearm that led to the death of her 2-year-old child. This entry was posted in Accidental Shooting, Baby, Dead, Florida on November 25, 2013 by usgunviolence. The father of a New Market, Md., family fatally shot his wife while she was holding their 3-month-old baby, killing them both before he turned the gun on himself, the Frederick County Sheriff’s Office said Monday. The shooter, 40-year-old Benyam “Ben” Asefa, had recently lost his job, investigators said. Deputies found Asefa; his wife, 42-year-old Barbara Giomarelli, and their infant son dead inside their home Wednesday night after the couple’s 5-year-old daughter fled to a neighbor’s. Authorities say that Giomarelli was filling a bathtub with water for their daughter’s bath sometime between 6 and 8 p.m. Wednesday when she and her husband got into an argument. At some point, both adults went downstairs, where Asefa shot Giomarelli with a 9mm handgun while she was holding their infant son, Samuel, authorities said. The bullet that struck Giomarelli traveled through her body and hit the baby, investigators said. The 5-year-old girl waited in the bathtub for some time before she got dressed and went downstairs, where she found her family. She then went to a neighbor, who called 911. Deputies went to Woods Court in the Lake Linganore development about 8:15 p.m. Wednesday in response to a 911 call from the neighbor who had spoken with the girl. In the girl’s home, they discovered Benyam Asefa, 40, Barbara Giomarelli, 42, and Samuel Asefa, 3 months, all dead of apparent gunshot wounds. Several times before her death, Giomarelli had stayed over at a friend’s house to be away from Asefa, who had recently lost his job and started drinking. Further friction developed over the care of their two children, one of whom — 3-month-old Samuel Asefa — suffered from a medical condition, the documents state. This entry was posted in Baby, Dead, Domestic Violence, Maryland, Multiple Shooting, Murder-Suicide on November 20, 2013 by usgunviolence. WHO IS THE REAL MONSTER? ADAM LANZA OR GUN INDUSTRY CEOS?